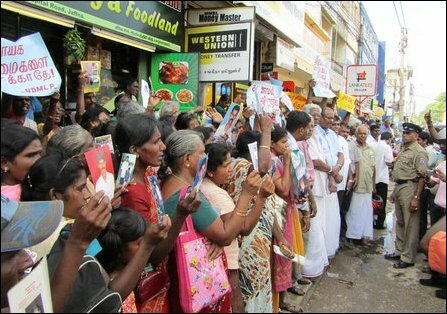 For the first time in Jaffna, kept under the iron fist of occupying SL military, parents and relatives of the missing persons, braved SL army barriers and harassment by the occupying soldiers and riot police and staged a protest in front of Jaffna Bus stand on Wold Human Rights Day seeking global attention on the plight of those reported missing since the end of Vanni war in 2009. 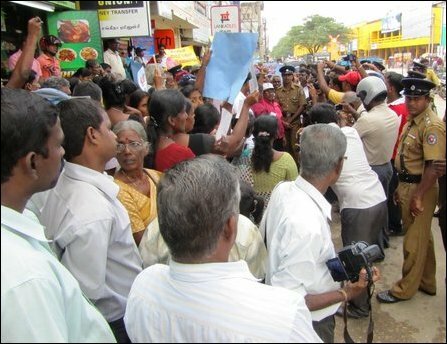 The SL military and police blocked the organisers from Colombo, the Civil Monitoring Commttee of missing persons, at Veampadi in Jaffna, for hours blocking them from reaching the site of the protest. The protestors managed to intuitively stage the rally without the organisers, political observers in Jaffna said. In the meantime, a JVP dissident group member, Lalith Weeraraj, who was on his way to the protest site has been reported missing at Aavarangkaal. The SL Police attacked reporters covering the protest. Tension prevailed in the city of Jaffna as the SLA personnel were deployed at several checkpoints questioning and harassing people asking the travellers where they were heading. Each and every traveller on Point-Pedro Jaffna Road were stopped and checked at 8 check posts by the SL military reminding the days of 2007. When people gathered at the site around 10:00 a.m., the Police officers present at the site dispersed the demonstrators saying that they had no permission to protest. Former parliamentarian S. Kajendren of TNPF, came to the protest site and argued with the Police saying that people had the right to stand along the road side and stage a protest on Human Rights Day. 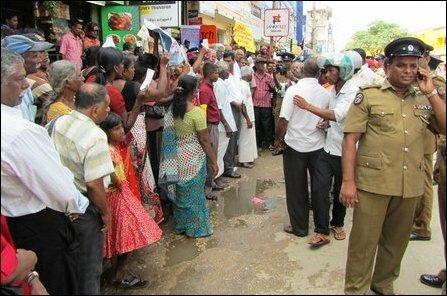 As TNA MP Vinyagamoorthy, former MP Sivajilingam and TNA MP Mavai Senathiraja managed to reach the site, the SL police had to end the harassment at the site of the venue. Around 50 persons who had come from South, representing various parties and the organising committee, were blocked at Nelliyadi and were only allowed to attend the protest at the last minute after they staged a protest at Nelliyadi. The organisers and parties were not allowed to bring in their placards. 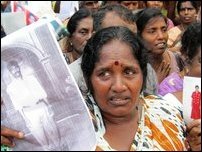 Several parents of the persons reported missing since the end of genocidal war on Vanni in 2009, said they had witnessed their kith and kin, now reported missing, reach the Sri Lanka Army controlled territory. 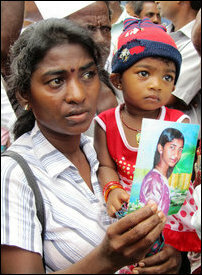 There were parents of missing who had been taken away from the barbed-wire detention camps in Vavuniyaa. A number of persons have also been abducted after their release. 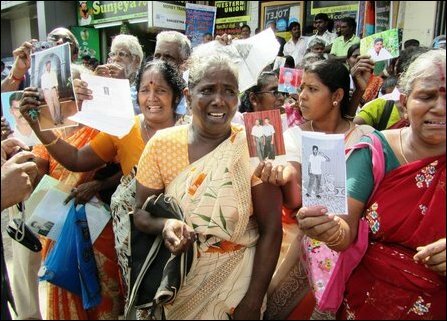 One of the main demands of the protesters was to pressurise the Sri Lankan state to publicly release the names of those under their detention.